Competitive Edge Products is delighted to offer the fantastic Kodiak Canvas Tent 0650 Wall Enclosure for Model 6133 Deluxe Awning Tent. 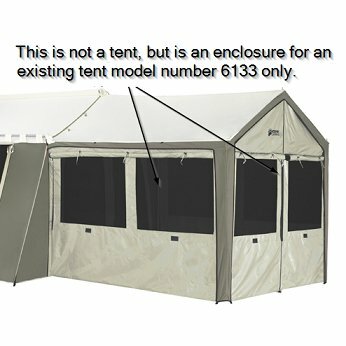 The 0650 wall enclosure seals off your deluxe awning on the Kodiak Canvas tent model 6133. This keeps you and your family safe on the inside from insects on the outside. Please note that this wall accessory works with Kodiak tent model 6133 only. Made with polyester denier cloth. The bottom has a poly fringe "sod cloth" to help seal out crawling critters. Shipping weight: about 18 lbs. Shipping dimensions: 12 inches x 12 inches x 6 inches. Attaches to the deluxe awning of the 6133 Kodiak tent via velcro strips.